Clipp-ity-Clop the horse went down the block. The rider stopped short of the general store and the horse was happy to go there. Together they bought treats and carrots for energy. And, rode on to much adventure! Now your kiddo can become the adventurer with this Brown Horse Costume. They can be the good sheriff in town, the ultimate wrangler, a desperado, or a rancher! Poking around the old west is fun for horses, after all, but it's even better for adventure seekers. Your pretend cowpoke could round up wildly rascals or pan for gold. Or maybe horsing around and learning tricks is more their style. They can gallop around and yell, "Yee Haa!" to their heart's content. Get ready to gitty-up for adventure! 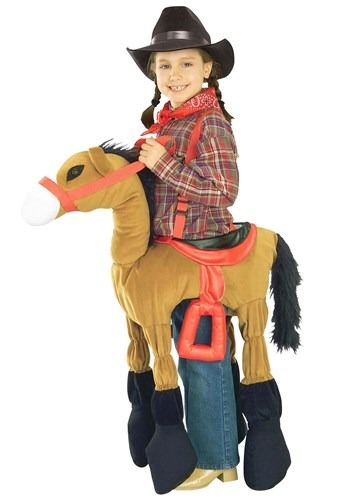 Whether it be for creative play, or Halloween, your cowboy or cowgirl will love to ride around with this kid's costume. As an added bonus, in this Brown Horse Costume they can never fall off the horse! Safe and sound they can ride through the wild west. The plush horse is attached to adjustable suspenders because adventurers come in all sizes. The plush horse has stuffed legs measuring 14 inches. Reins are attached to the muzzle clasp with Velcro for ultimate control over the horse. Just add jeans, cowboy boots, a bandanna, and western hat to complete the look. Happy trails to your little cowpoke as they ride off to the sunset!